Pond Leak: How Much Evaporation Is Normal? Sometimes you wonder if your pond is leaking or the evaporation is getting too much. You need to understand just how much evaporation is going on in your pond for you to know precisely when you are suffering a leak. However, there are so many factors that determine the rate of evaporation so there can’t be any specific formula for doing that. Again, your pond can lose water without dissipation, so you cannot be sure how much is lost due to evaporation. The rate of evaporation depends on factors like the humidity, shade over the pond, wind, cloud cover, and other elements in the pond. 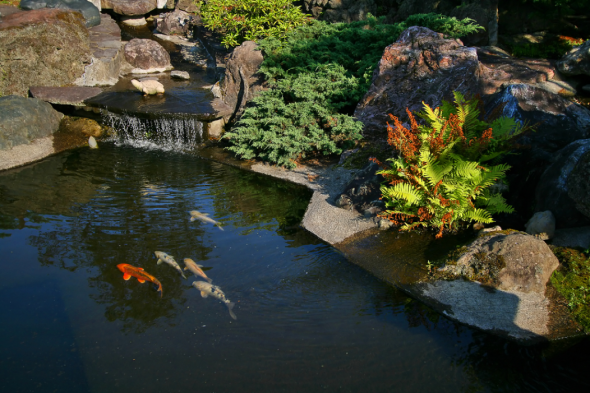 The greater your pond exposure to the atmosphere, the higher the rates of evaporation. Other factors that can also lead to losing water in ponds are design faults, excessive splash from fountains and waterfalls, plants, roots and mulch in the pond. These factors, however, should not lead to substantial loss of water. If you notice the excessive loss of water from your pond, then you should check for leaks. The following steps will help you figure out the leak on your pond that is causing the excess loss of water. Turn off the pump and observe the water level of the pond. If you notice a quick drop in the level of water, you can skip the next step and move over to the third, if not continue with the next step. Once the water does not drop significantly after you switch off the pump, you should know that the leak is not from the pond basin. Now you have to take your search further to other fixtures in the pond. Inspect all your plumbing joints and make sure there is no leakage. Search further the fountains and waterfalls to make sure there is no leakage. Check around the pond and notice if there is a wet spot somewhere, this will help you narrow your search. If you still can’t find the leak, move over to step three. If you still can’t find the leak, then you have to make this next move. You have to allow the pond water leak off until it stops so you can trace the empty liners for a leak. If the water drops too much, you have to move out the fishes and plants so they will not be affected. Check randomly for the leak across all areas. Check the edges, the rocks, the liners for any tear, slash or inordinate compressions that may be responsible for the leak. Once you find it, you can now take care of it before returning your pond to its normal state. If your pond liners are old and worn out, Swell UK offers a wide range of pond liners, so you can easily choose a replacement and get your pond back in shape. Once you fix the leak, continue to monitor the water level to make sure your solution was adequate.